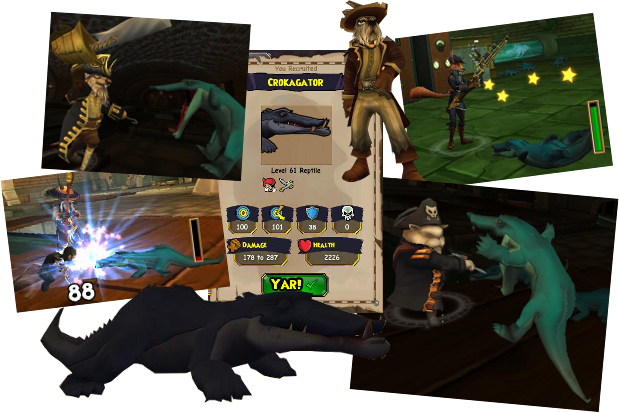 When I talked to Crokagator Dundee, he needed help getting his "knife" back from the Crokagators, so naturally I decided to help him. This led to a line of quests where I had to track down the source of all the crokagators that were invading the sewers. The cool thing is that I got a new crokagator companion from this. His stats don't look too bad, but I haven't had a chance to use him yet, so I'm not sure how much I will like him. Either way, it's always fun to expand my crew! There was also a line of quests that kind of reminded me of in Cool Ranch, when you had to track down a bunch of bad guys and lock them up for the Sheriff. Except this time, I was trying to prove myself worthy of being a bounty hunter for Mann the Bounty Hunter. First I had to track down a couple of people who had stolen different thing (fruits and bandages, if I remember correctly) and then came the interesting part. Mann the Bounty Hunter sent me to arrest this "crackpot" (Bonnie Anne's word, not mine). This guy thought he was actually a clockwork :P LOL So I finished those quests with no issue. 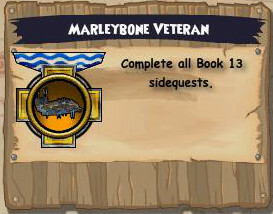 Anyway, there were a few other quests as well, but I don't remember the details too much. They did give decent NXP and gold though, so you might want to check them out. I am already almost level 59 before I even start Aquila! I am hoping this will make things a little easier there. Oh, and I also received my Book 13 badge for completing these quests. Thanks for reading and see you in the Spiral!